In a British weekend of sport (with Wimbledon taking place at the same time) thousands of UK fans gathered at the Silverstone circuit hoping to see their countryman claim the chequered flag – and they didn’t walk away disappointed. But this particular win did not come easy. The Brit in question was, of course, Lewis Hamilton, as Mercedes continued to dominate in Silverstone – even if it didn’t look like they would at the start of the race. As the lights went off at the historic circuit the pole sitter Hamilton and his team-mate Nico Rosberg, next to him on the grid, were stunned (together with the rest of the onlookers) by a pair of Williams cars whizzing past the Silver Arrows to the front. 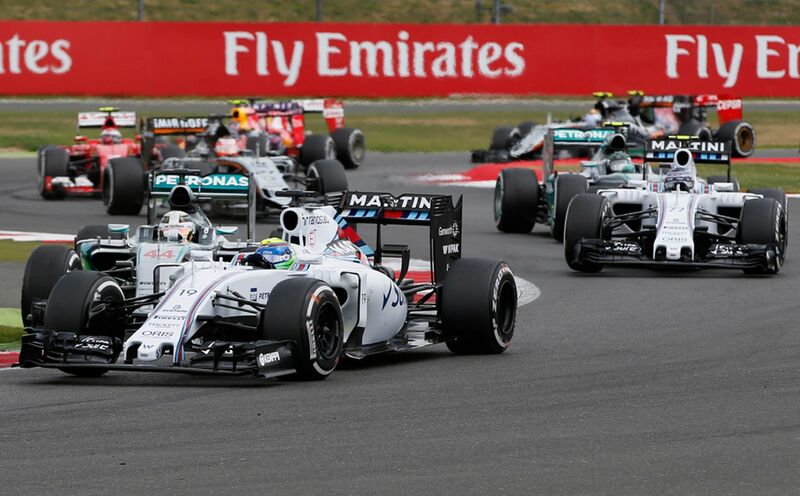 The speed at which Felipe Massa moved from his third grid spot to the lead was tremendous – and although Williams were expected to challenge Ferrari for the podium in Silverstone, no one could predict their outright speed off the starting line. Hamilton managed to recover one lost position in a few corners, dropping Massa’s team-mate Valtteri Bottas to third, and leaving his own team-mate Nico Rosberg in fourth. Williams’ strong start took everyone by surprise but in the end they couldn’t make it stick. Although Massa looked strong for pulling away, his efforts were trimmed by a safety car, prompted by a double crash on the first lap. In a bunched up mid-field Romain Grosjean threw his Lotus into his team-mate Pastor Maldonado, eliminating them both from the race; at the same time, in an avoiding action McLaren’s Fernando Alonso swerved away from the two Lotus – and straight into his team-mate Jenson Button, which marked the end of the Brit’s running on his home turf. Despite the crash and a lengthy front-wing change Alonso continued the race to win his first point of the season by crossing the line 10., amid a heavily curtailed finishing grid. Following the short safety car period Massa shoot out to the lead after defending from Hamilton, who scrambled to reclaim his position and ended up running wide, which allowed the Brazilian to extend the gap – and opened a window for Bottas to jump into second again. The spectacle fired up even more when the Finn closed the gap to his team-mate and the Williams garage allowed the two drivers to battle it out, bearing in mind the pursuit of Mercedes behind them as an absolute priority. While Bottas made several attempts to attack Massa, Hamilton decided to dive in for his tyre change – a spotless 2.4sec operation which saw him emerge behind the front trio. Massa and Rosberg followed suit on next lap – both had lengthier stops than Hamilton, with Williams a fraction slower than Mercedes, meaning the two were side-by-side when exiting the pits, but eventually the Brazilian forced himself ahead – and yet, behind Hamilton. It was yet another DNF for struggling McLaren as Button was taken out of the race in first-lap contact. At that point – with still 31 laps to go – it seemed the Brit had the win in the bag; but a traditionally capricious Silverstone weather was not going to make that easy. The changing conditions created an overtaking situation for Rosberg who moved up to second and gained speed on his team-mate. But as the drizzle began turning into rain Hamilton made the decision to go in for a second boot change and put on an intermediate set; on that same lap his team-mate struggled to manage his car on the wet track and decided to follow in the Brit’s footsteps – but by then it was too late, and Hamilton cruised to his 38 career win – to the delight of the crowds. 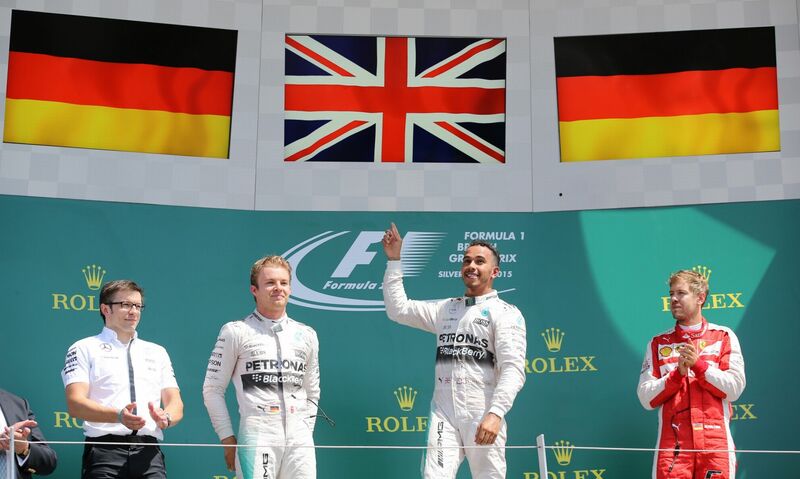 Before he was handed the legendary gold trophy, the UK anthem was followed by his team’s German one – which was quite apt considering the two other drivers on the podium steps: Rosberg to the Brit’s right, and Sebastian Vettel to his left. 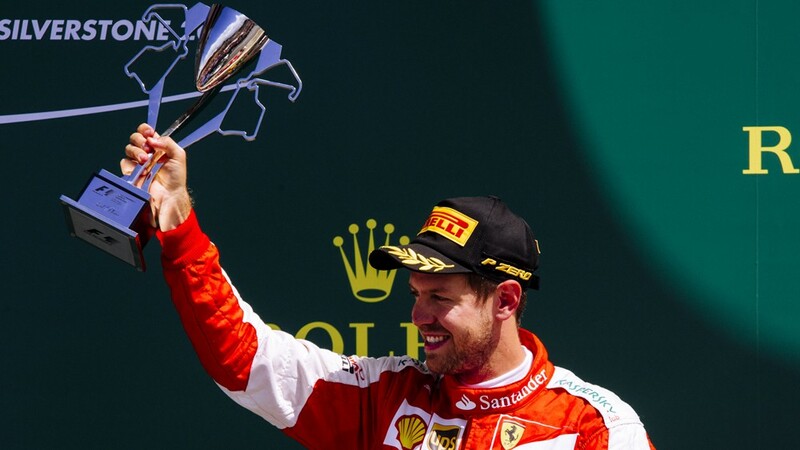 The Ferrari driver’s performance came as another surprise in Silverstone considering the four-time champion had missed out in qualifying to his team-mate Kimi Raikkonen and was then overtaken by Nico Hulkenberg’s Force India (who finally raced their complete 2015 spec car) on the first lap. In the course of the race Vettel benefitted from his team-mate’s pre-mature decision to switch to the intermediate tyre and his own subsequent better timed stop. The boost in performance from the grooved rubber allowed Vettel to nudge himself ahead of Bottas and Massa, handing the final blow to Williams. Vettel continues to deliver in the Mercedes-led season. In the meantime, Raikkonen split up the two Force India finishing in eighth, with Sergio Perez closing the double-point finish for the Silverstone team in ninth. The only other point scorer was Daniil Kvyat, who crossed the line in sixth; his Red Bull team-mate Daniel Ricciardo did not make it as far, after a suspected electrical problem forced him to retire half-way through the race. The Aussie joined two other retirees from his sister outfit Toro Rosso: Max Verstappen made an early exit when he spun off the track and into the gravel on lap four, while Carlos Sainz Jr. abandoned his car in the slip road on lap 31. Among the greats: Hamilton has etched his name in Silverstone gold for the third time. 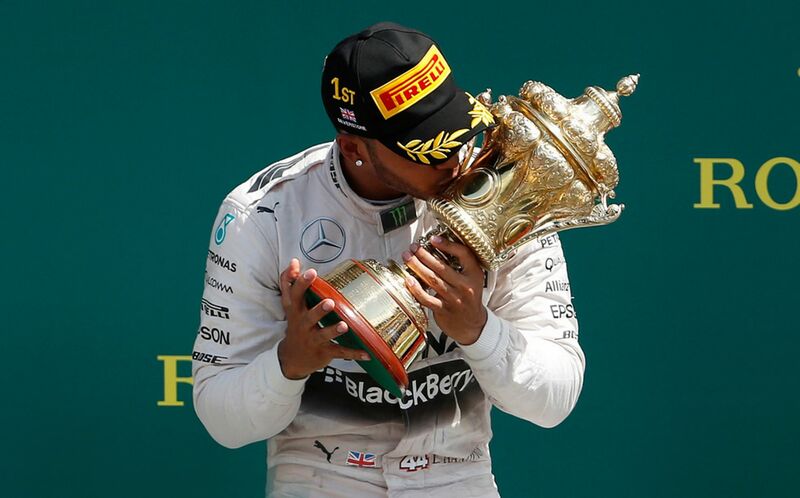 Hamilton’s historic victory has put him among the greats in Silverstone – Jack Brabham, Niki Lauda and Michael Schumacher – who all won the British Grand Prix three times. He has also extended his championship lead over Rosberg to 17 points – but in the end, the only thing that mattered on Sunday afternoon were the fans.